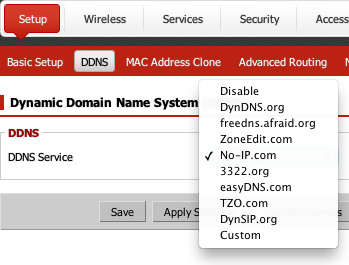 Those that have replaced their router’s firmware with DD-WRT have the option to use DynDNS.org, freedns.afraid.org, ZoneEdit.com, No-IP.com, 3322.org, easyDNS.com, TZO.com, and DynSIP.org (or you can use another “custom” service). Just remember that if you want to use a free DNS service, you need to sign up for one of those alternatives before the May 7 cutoff date, preferably long enough before that you have the time to update any configurations that specify the DynDNS address. Don’t put it off until you realize that your dynamic address will be no longer functional in just a few hours, or worse yet, has already ceased to function!